What in the world are these? As it turns out, these are overflow tables for Index Organized Tables. This means that ACCOUNT_TYPE_CODE and DESCRIPTION will be kept in the index, since these are pretty much the only columns normally accessed; the rest, including the big comments field (which seems to be largely unused), will be stored in the overflow table if they are set. Looks like someone’s looking for an APEX developer here in Perth. Using Chrome? Sick of certain sites-I-won’t-name-here cluttering the search results when you google for technical issues? Installed. Already blocked a few sites. Beautiful. EDIT: just noticed it doesn’t work in conjunction with AdBlock – if I enable AdBlock, the blacklist stops working. My client has decided to design and build a completely new replacement system for an aging system running on Oracle Forms 6i on Oracle 8. The new system will have a web frontend, backed by Hibernate (don’t get me started) on top of an Oracle 11gR1 database. Crucially, due to changes to business practices and legislation, the new system has been designed “from scratch”, including a new data model. My task is to write the ETL scripts which will take the data from the legacy database (an Oracle 8i schema), transform it to meet the requirements of the new model, and load it. If you’re looking at building scripts to transform data from one system to another, the method I used might be helpful for you too. Making it more complicated is their desire that the data move be executed in two stages – (1) before the switch-over, transform and load all “historical” data; (2) at go-live, transform and load all “current” data, as well as any modifications to “historical” data. Since the fundamental business being supported by this system hasn’t changed very much, the old and new data models have a lot in common – the differences between them are not very complex. In addition, the data volume is not that great (coming from someone who’s worked with terabyte-scale schemas) – the biggest table only had 2 million rows. For these reasons, the purchase of any specialised ETL tools was not considered. Instead, they asked me to write the ETL as scripts that can just be run on the database. These scripts must be re-runnable: they should be able to be run without modification to pick up any changes in the legacy data, and automatically work out how to merge the changes into the new schema. The first step for me was to analyse both data models, and work out a mapping for the data between them. The team for the project had a very good idea of what the tables in the new model meant (since they had designed it), but there was no-one available to me to explain how the old data model worked. It was down to me to learn how the legacy data model worked – by exploring it at the database level, examining the source for the forms and reports, and in some cases by talking to the users. The outcome of this analysis was two spreadsheets: one was a list of every table and column in the legacy database, and the other was a list of every table and column in the new database. For each table in the legacy database, I recorded which table (or tables) the data would be migrated to in the new schema, or an explanation if the data could be safely disregarded. For each table in the new schema, I recorded which table (or tables) in the legacy database would feed into it. In the end, eleven of the tables in the new schema would be loaded. Thankfully, in no cases was the mapping so complicated that I couldn’t envisage how it could be done using relatively simple SQL. Once the spreadsheets were filled, I was finally able to start coding! Now, instead of writing a whole lot of INSERT, UPDATE and DELETE statements, I thought “surely MERGE would be both faster and better” – and in fact, that has turned out to be the case. By writing all the transformations as MERGE statements, I’ve satisfied all the criteria, while also making my code very easily modified, updated, fixed and rerun. If I discover a bug or a change in requirements, I simply change the way the column is transformed in the MERGE statement, and re-run the statement. It then takes care of working out whether to insert, update or delete each row. grant CRUD on all tables in the target schema to MIGRATE. All my scripts will run as the MIGRATE user. They will read the data from the LEGACY schema (without modifying) and load it into intermediary tables in the MIGRATE schema. Each intermediary table takes the structure of a target table, but adds additional columns based on the legacy data. This means that I can always map from legacy data to new data, and vice versa. This was the simplest transformation you could possibly think of – the mapping from one to the other is 1:1, and the columns almost mean the same thing. You’ll notice that the intermediary table has the same columns of the new table (except for VERSION_ID, which will just be 1), along with the minimum necessary to link each row back to the source data – the primary key from the source table, PAR_ID. You might also notice that there is no unique constraint on PARTY_ID – this is because we needed to do some merging and de-duplication on the party info. I won’t go into that here, but the outcome is that for a single PARTY_ID might be mapped from more than one OLD_PAR_ID. You’ll notice that all the transformation logic happens right there in a single SELECT statement. This is an important part of how this system works – every transformation is defined in one place and one place only. If I need to change the logic for any column, all I have to do is update it in one place, and re-run the MERGE. This is a simple example; for some of the tables, the SELECT statement is quite complex. There is a follow-up UPDATE statement that for a couple of thousand records, changes the PARTY_ID to a different value; in effect, this performs the de-duplication. 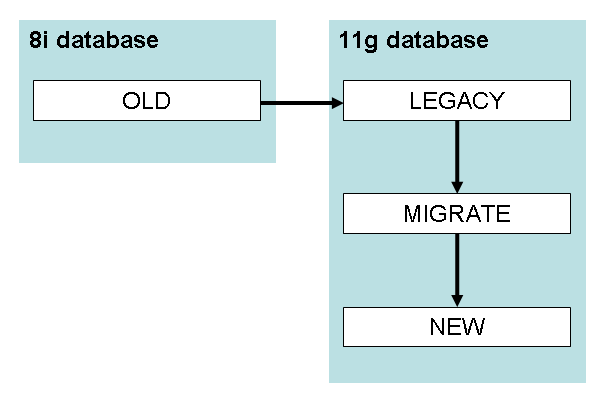 The idea is that the data in the MIGRATE table is *exactly* what we will insert, unmodified, into the target schema. In a year’s time, we could go back to this MIGRATE schema and see what we actually inserted when the system went live. In addition, we’ll be able to go back to the LEGACY schema and see exactly how the data looked in the old system; and we’ll be able to use tables like MIGRATE.TBMS_PARTY to map back-and-forth between the old and new systems. The SELECT clause brings back each row from the intermediary table that has not been merged to a new record (by the way, those records are needed because they are used when transforming PAR_ID values in child tables) or that has not been modified since it was previously loaded. The MERGE inserts any new rows, updates all columns for modified rows, and deletes rows that have been marked for deletion. NO transformation of data happens here. A common issue is a failed check constraint, e.g. where the old system failed to validate something correctly. We’d then go back and either change the transformation to work around the problem, or send the data back to the business and ask them to fix it in the source. Each stage of this ETL solution can be restarted and re-run. In fact, that’s what we will be doing; a few weeks prior to go-live, we’ll get a preliminary extract of the old system into the LEGACY schema, and run all my scripts. Then, at go-live, when the old system is taken down, we’ll wipe the LEGACY schema and refresh it from Prod. We will then re-run the scripts to take changes through. All the scripts for each table had the same structure: one script to create the intermediary table; one script to do the merge into the intermediary table; and one script to merge into the final destination. With the exception of the SELECT statement in the first merge script, which differed greatly for each table, these scripts were very similar, so I started by generating them all. For this I used queries on the data dictionary to generate all the SELECT lists and x = y lists, and after a bit of work I had a complete set of ETL scripts which just needed me to go in and make up the SELECT statement for the transformation. For this case, a relatively simple data migration problem, this method seems to have worked well. It, or a variation on it, might very well work for you too.